Why Less Is More for WOSPs (Well-Intentioned, Overinvolved Sports Parents): How to Be the Best Sports Parent You Can Be . Youth sports began as a way to develop character and values, but they've evolved into a booming industry that involves millions of kids playing on traveling teams, hiring personal trainers, and attending camps and clinics, all in the hopes of achieving athletic greatness. Parents want the best for their kids. Unfortunately, wanting what is best is not always the same thing as doing what is best when it comes to children and sports. 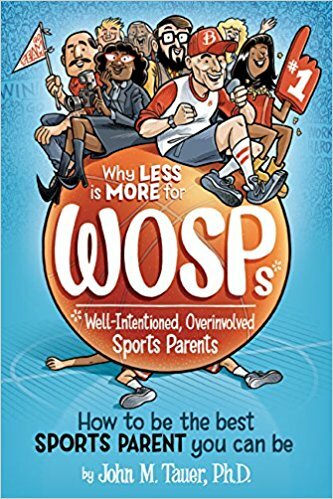 In Why Less Is More for WOSPs (Well-Intentioned, Overinvolved Sports Parents), Dr. John Tauer weaves rich stories together with empirical research and psychological theory to explain how the good intentions of WOSPs have gone awry to create a culture of overtrained and overstructured children. What types of goals should parents have for their children? How can we light a motivational fire in our children, and then step back and watch it continue to burn on its own? Tauer addresses these and other important questions throughout this must-read book.